Bibliophiles beware! There is a tiny terror living in your house! Chain the doors; lock the windows; hide your books! This little monster is on a mission to destroy! Perhaps that is a bit dramatic, but regardless, you should be aware and prepared when it comes to your little one and household hazards. As soon as she is on the move, you will need to start thinking of the many areas of your home that you need to child-proof, both to prevent injury and destruction, and your bookcase is no exception. Your little one has just had the world open up to her; she is beginning to crawl, and now she will be searching for anything she can get her hands on. Everything is new and interesting to her. You will probably begin to hear yourself saying “no” a lot more and finding that you are getting into much better mental and physical shape (constantly alert, sprinting and diving to pull that thing out of her mouth again). If you are an avid book collector, like me, they are likely some of your most prized possessions. They are in pristine condition and you would hate for anything to happen to them. To your baby, they are toys, with pages ready to be torn out and covers waiting to be chewed on. So, how do you prevent this from happening? Redirecting can be exhausting, as your baby is likely to try again every chance she gets. So the best (and easiest) option to protect your books is to simply remove temptation. Move your books to a higher shelf, where they cannot be reached by little hands. Replace your books with her books, the ones that your baby can look at. You can also use these lower shelves to store toys or other items that are safe for your little one to play with. There are some great do-it-yourself (DIY) options for keeping those books out of your baby’s line of sight or reach. One way is to use a fitted sheet, which you probably already have lying around the house somewhere, to cover your bookcase. However, if you need to grab things often, this method may not be the most ideal (not to mention it is not the most visually appealing). One parent used velcro strips and clear vinyl to cover the front of their shelf. This option is great as you can still see your books, and you can just peel back the section you need to get to and re-stick it after you are done. If you are not concerned with seeing your items, you can even do this with patterned fabric. Here is a written tutorial with pictures. As much as you want to keep your baby safe, you do not really want to make things more difficult for yourself. Always having to step over a baby gate or move furniture or lift up a sheet to get to what you want is not the most ideal. But when you have to ensure your child’s safety it is a small price to pay. This parent found a way to do little work while still managing to keep their books on the shelf. Use old bicycle inner tubes. They are basically giant rubber bands. Tie them around your bookcase to keep your little one from being able to pull the books off while keeping it easy for you to grab them. When you become a parent, you are suddenly hyper-aware of all of the hazards in your house, and you desperately look for any way you can keep your greatest treasure protected. So, naturally, a bigger concern to you over your books getting hurt is the possible injury that could befall your baby. Heavy books can do some damage to little toes, not to mention the hazards the shelf holds in itself. You can say no until you are blue in the face, but this may not get a compliant response. Instead, try finding ways to say yes while getting the result you desire. More simply put: redirect your child’s attention. Another option is to move the case altogether. If you have an office or designated reading space, it may be ideal to move it here, especially if you have the option of hiding them behind a closed door. This is a little bit more of a hassle, as rearranging furniture may be the last thing you may want to do while chasing after a little speedster. In doing so you might save yourself many years of frustration though. As they get older they still like to grab things and climb. After the crawling comes the standing. Pretty soon, your little one will start pulling up on all of your furniture, and she is likely to have some falls as she is learning to balance and become more steady on her feet. The shelves of your bookcase likely have sharp corners, which would not feel comfortable for baby to hit her face on. Obviously, you can try to always keep an eye on her, stopping her from getting into anything dangerous or catching her before she falls, but, let’s face it, that is impossible. She will only get faster and you are not going to be able to be there every time. You need a way to soften those edges to prepare for the inevitable. 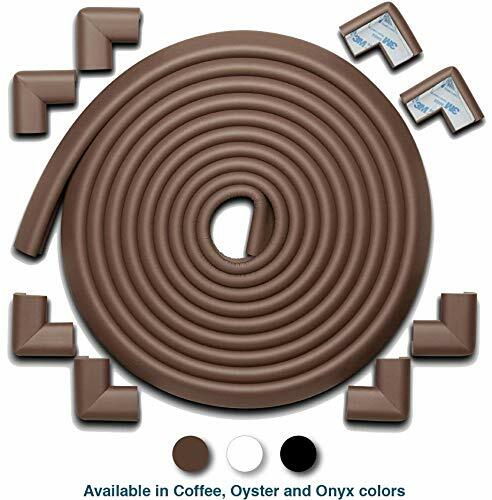 One great product you can use is this handy cushioned tape. Great for sharp corners and edges, it comes ready for you to use with double-sided tape. Simply measure, cut, peel, and stick. You can save even more money by using any old towels you may have laying around. Just cut them to the size you need, wrap the edge of the shelf, and use tape to hold it in place. 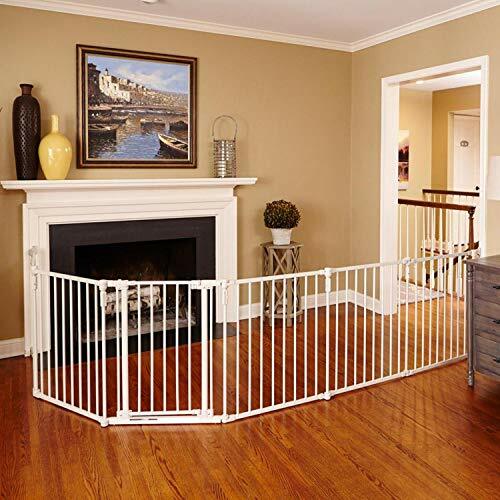 If you wanted to keep the whole area off limits, you could isolate the whole room with a standard baby gate in the doorway. This can be a nuisance though if it is a doorway that you are using constantly. An alternative is to get a wide and adjustable baby gate. These are typically used for no-go areas in the house for babies, like a fireplace. The bendable panels allow you to set up a customized barrier and keep most of the room freely accessible. Once she has mastered the standing, your baby will likely soon become a climber. A bookcase is especially appealing for her to try out her skills, with the shelves creating the perfect ladder. If we really need to scare you into action here…. 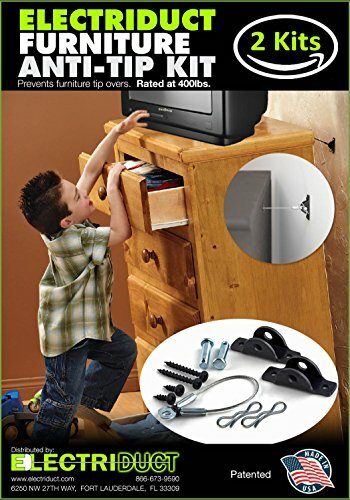 While it may seem to hold a lot of weight, your bookcase was not meant to be pulled on the way your child will. There is a great risk for her to pull it right down on top of herself. Your best option is to anchor that thing to the wall. When you bought your bookcase, it may have come with anchoring brackets so you could attach it to the wall. More than likely, you just put these aside or tossed them in the garbage. If you still have these lying around somewhere, now is the time to pull them out. You can use these brackets (in conjunction with a wall stud) to keep your shelf upright, firmly attached to the wall. If your shelf was not packaged with brackets (or the ones it did come with are long gone), you can easily purchase these on Amazon. Be sure to check your shelf for a solid area to attach them to, as well as an ideal place in your house where the drywall won’t be ripped apart before you make your purchase. 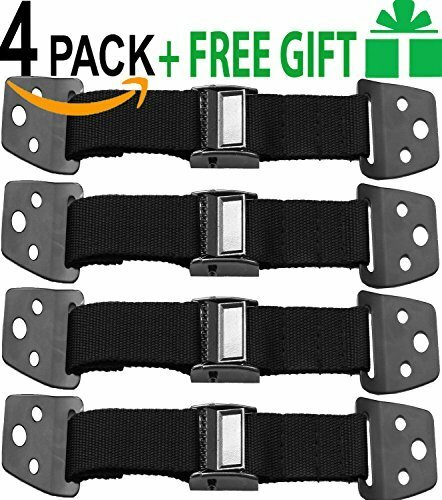 You can also use these handy straps to attach your furniture to your wall. They are cheap and easy to use. They fasten to the back of your shelf, with the help of a couple of screws, and create a tether between your bookcase and the wall. Because they are behind the shelf, they do not create an eyesore and leave your furniture looking very aesthetically pleasing. No need to fear or stress. While it may seem like a daunting task, baby-proofing can be both easy and affordable. You naturally want to protect your child from every scrape, bump, and fall, it is good for them to have a few so they can learn to pick themselves back up again. Just focus on guarding the most dangerous areas, and relax about the rest.